More Info: Good for families. 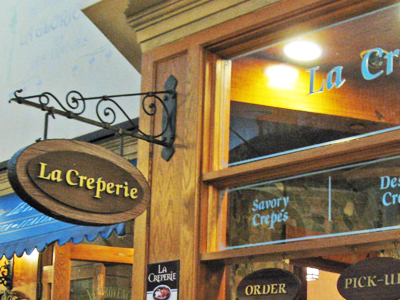 As the name implies, La Creperie is the epitome of French Crepe cuisine. The extensive selection of crepes offered for breakfast through dinner will surely entice your return on any day in Vegas. Enjoy viewing the preparation of your culinary masterpiece at this walk-up café that will enhance your appreciation of the French Crepe. Choose among sweet, vegetable, meat and many other fillings to give you the absolute, most delicious, mouth watering meal hot off the griddle. Share with a friend and order both a savory and a sweet crepe; you will have a filling and fulfilling meal! Who can resist a caramel apple crepe? Every crepe I had has not been disappointing. The wait is a little long but well worth the wait! My favorites are the shrimp scampi for the meal and the all berry for dessert.